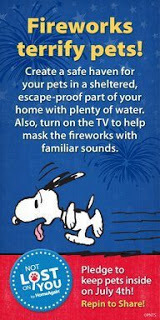 There is always a lot of talk about the dogs that end up in the shelters on the 5th of July and how important it is to keep your dogs safe during this holiday. What you don't hear so much about is the “clearing and culling” of dogs in the shelters to make room for the dogs who will come in. The rate at which they kill the shelters dogs is high after the 4th of July, but it is worse the day before. It is heartbreaking. I know someone who has on her email, “For every dog euthanized there is a person responsible”. If you let your dog out on the 4th, and he dies in the shelter… are you also responsible for another life who died so your dog could go to the shelter in the first place?